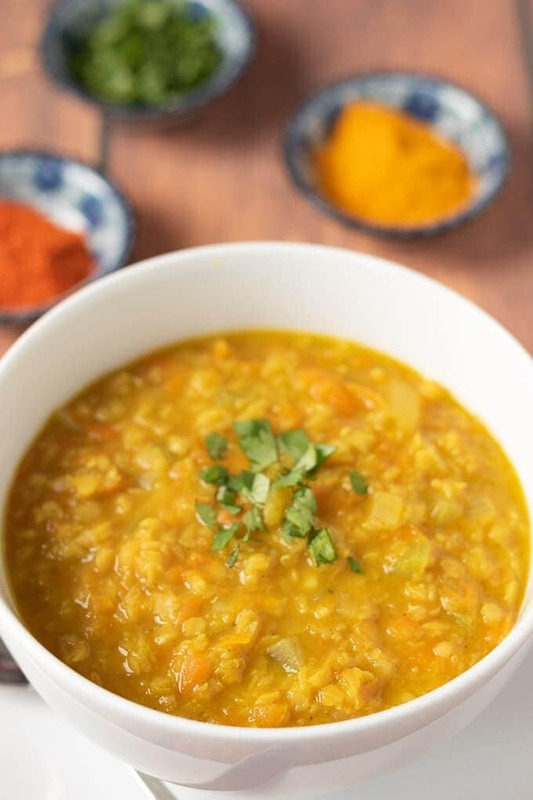 Curried red lentil soup is a tasty soul warming soup that can be on the table in just one hour! This heart healthy soup serves 4 and is easy to make too! 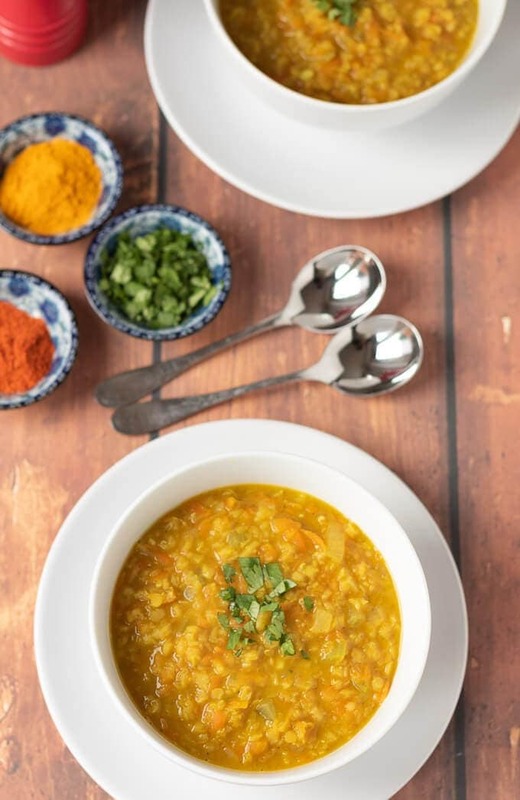 Folks, if you’re feeling in need of a bowl of soup that gives you a hug then this curried red lentil soup is just the thing! This is a tasty and filling, yet delicately spiced bowl of nourishment. 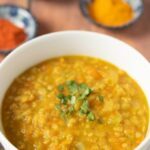 Easy to make and made with basic healthy ingredients this red lentil soup doesn’t cost a lot either. If you’ve just returned from a holiday like we have, or are still feeling the pinch in January then you’ll definitely want to add this to your list of favourite basic budget soups! Yes, Lady Lynne and I have just returned from a wonderful one week winter break in Cape Verde. There was no mountain climbing this time, unlike our epic trip last year climbing Kilimanjaro. Nope! Whilst we did take a one day trip around the island, the rest of our time was spent lying by a pool, reading our books, sipping cocktails and discussing what food we were going to have at the next meal from the amazing buffet! We do have some more amazing travel adventures planned for later this year though. In fact we’re booked up to explore some of the mountain areas in the tropical island of Bali. As well as a three day stopover at Hong Kong first. Oh and we’re doing The Cumbria Way in May. That’s first. Back to this tasty curried red lentil soup. I’ll just say that when you go from temperatures of near 27 degrees C, to near zero and snow after a 6 hour flight you crave warm comforting food. 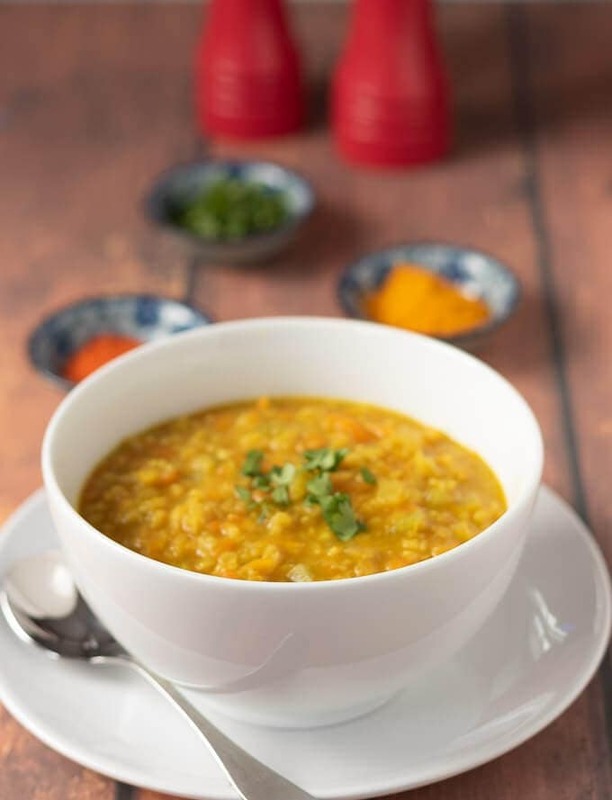 All I could think of as the cold winter climate of Britain took its hold on me when we stepped off the aircraft was a bowl of this thick and heartening curried red lentil soup! Lentils are packed with protein and have less saturated fat and cholesterol than beef, poultry or fish. This is said to make them a better protein choice. Protein isn’t the only nutritional benefit you’ll receive when eating lentils though. They’re also packed with vital minerals like iron, potassium, phosphorous, zinc, folate and niacin. Lentils are also rich in soluble fibre, which can help to reduce or prevent high blood cholesterol levels. Healthy carrot and lentil soup is a simple, tasty and filling bowl of deliciousness! Vegan and gluten free, it takes just a few budget ingredients and spices to create this hearty quick healthy soup! Sweet potato and red lentil soup is a delicious and easy recipe. This healthy vegan and gluten free soup is a perfect filler that never fails to please. 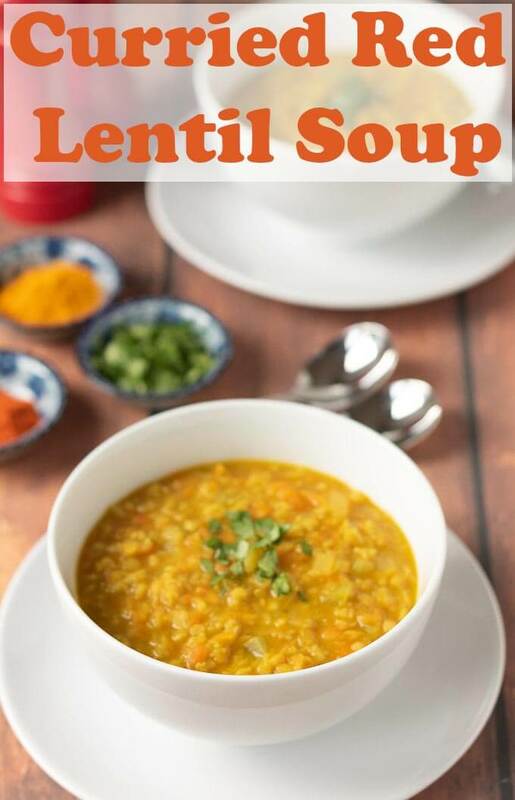 Easy Scottish lentil soup is the authentic healthy red lentil soup from Scotland. This simple soup is filling, comforting and perfect for cold weather days! 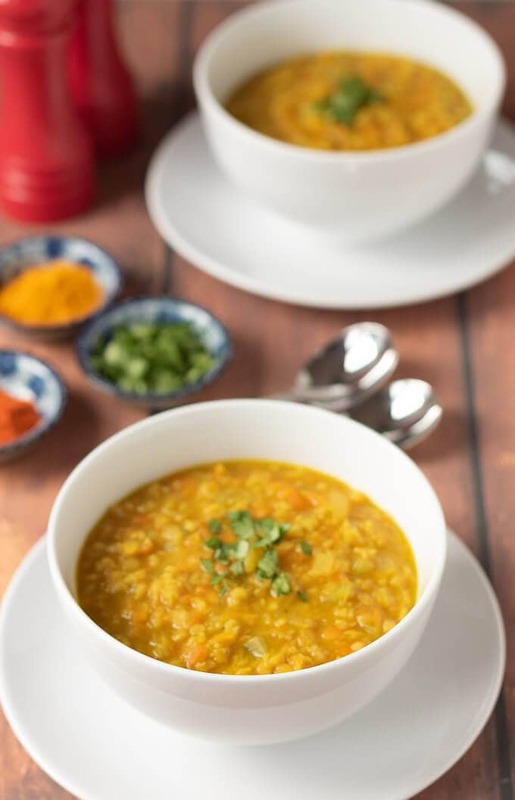 Folks, I hope you enjoy this amazing flavoursome curried red lentil soup recipe! I also nearly forgot to mention that its vegetarian, gluten free and easily freezable too. If you’re looking for more easy budget recipes like this then look no further than next Thursday when I’ll be bringing you a simple tuna tomato pasta dinner recipe. Not only is this soup extremely healthy and low calorie but you’ll find the smell of it whilst it’s cooking intoxicating! Gently heat the oil in a large soup pot and add the onion and celery to soften it, stirring occasionally for about 2 – 3 minutes. Then stir in the carrot and garlic for a further 1 minute. Add the salt, curry powder, turmeric, cumin and chilli flakes with a few grinds of black pepper. Stir to combine all. Stir well, bring to the boil and turn down to simmer gently for 20 –25 minutes until all the mixture is completely softened. Remove from the heat. When the soup has cooled a little stir in the milk and season to taste. Serve in bowls, garnished with the coriander. This sounds wonderful. The only problem I have is that, after a bout of bowel cancer I can’t eat lentils. In fact really sadly I’m a little bit limited on the pulse front. I can eat split peas though (and did your lovely yellow split pea and ham soup with the leftover Christmas ham!) so do you think this recipe would work with yellow split peas? Regarding using yellow split peas for this recipe I’m really not sure. I wouldn’t want to advise incorrectly so I would say you’ll need to try it out yourself to be sure. I haven’t tried it with any other pulses other than red split lentils. Sorry. This is really lovely. And I happen to have some red lentils in my pantry! I’ve ordered a new curry powder blend. When I made the Cafe de Paris butter I realized that my go-to curry powder has too much turmeric in it. Thanks Mimi. Yes I’ve made a few accidents in my time where I’ve put too much turmeric in recipes. It’s annoying when you have to start all over again on a recipe just because you’ve added too much of one ingredient! Sounds like you’ve already got a fun year of travel on the books, Neil. I can’t wait to follow along! In the meantime, though, it’s bitterly cold here and the thought of a bowl of hot lentil soup sounds awesome right now! In fact, I just discovered a bag of lentils in our pantry. I think I know how to use it now! Hope you have a delicious weekend ahead, my friend! I like most lentil dishes and your soup looks wonderful. I have to try it. Thank you for the recipe. The weather is perfect for a bowl of lentil soup although we Indians need no reason to make lentils or pulses coz we make them all through the year irrespective of the weather. It is staple of sorts. Neil, I love soups. Give me a bowl of soup any day and I love it. This one is definitely going to be added to my list, it looks so delicious and the absolute comfort food. Cape Verde must be lovely now. I traveled there in the early 80s and it was not so developed. Perhaps it’s time to give it another go. One thing for sure though, that’s a fine looking soup. Lentils are eaten often in our house and a quick recipe like yours suits our needs well. I love red lentils! And I always appreciate a new recipe to use them. Your spices are the ones most often used in my spice drawer. Can’t wait to try this – it looks so hearty and warming! Lentils are just the perfect versatile ingredient aren’t they Laura? So much you can do with them! I hope you get a chance to make and enjoy this soup. And thanks for taking the time to rate and comment on my recipe! What a beautiful looking soup! I guess it’s the color, but I really want to add corn to it! Adding corn to this soup sounds like a great idea Jeff. I like it! That would add a lovely little “crunch” to it wouldn’t it? Thanks for sharing. I’ve been trying to add more legumes and lentils to my diet and curry is a great way to go. I love how great the curry was when we visited the U.K., but can’t seem to find anything similar stateside.